JAMES 1:17 KJV "Every good gift and every perfect gift is from above, and cometh down from the Father of lights, with..."
14But every man is tempted, when he is drawn away of his own lust, and enticed. 15Then when lust hath conceived, it bringeth forth sin: and sin, when it is finished, bringeth forth death. 16Do not err, my beloved brethren. 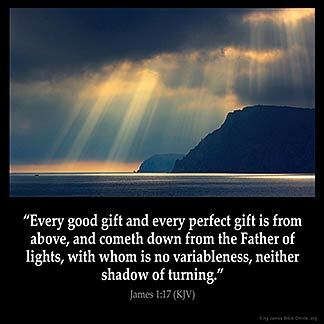 17Every good gift and every perfect gift is from above, and cometh down from the Father of lights, with whom is no variableness, neither shadow of turning. 18Of his own will begat he us with the word of truth, that we should be a kind of firstfruits of his creatures. 19Wherefore, my beloved brethren, let every man be swift to hear, slow to speak, slow to wrath: 20For the wrath of man worketh not the righteousness of God. Euery good gift, and euery perfect gift is from aboue, & commeth downe from the Father of lights, with whom is no variablenesse, neither shadow of turning. Every good gift and every perfect gift is from above, coming down from the Father of lights, with whom can be no variation, neither shadow that is cast by turning. Every good and true thing is given to us from heaven, coming from the Father of lights, with whom there is no change or any shade made by turning. Every good gift and every perfect gift comes down from above, from the Father of lights, with whom is no variation nor shadow of turning. Every gift which is good, and every perfect boon, is from above, and comes down from the Father, who is the source of all Light. In Him there is no variation nor the slightest suggestion of change. Ech good yifte, and ech perfit yifte is from aboue, and cometh doun fro the fadir of liytis, anentis whom is noon other chaungyng, ne ouerschadewyng of reward. 1:17 No evil, but every good gift - Whatever tends to holiness. And every perfect gift - Whatever tends to glory. Descendeth from the Father of lights - The appellation of Father is here used with peculiar propriety. It follows, he begat us. He is the Father of all light, material or spiritual, in the kingdom of grace and of glory. With whom is no variableness - No change in his understanding. Or shadow of turning - in his will. He infallibly discerns all good and evil; and invariably loves one, and hates the other. There is, in both the Greek words, a metaphor taken from the stars, particularly proper where the Father of lights is mentioned. Both are applicable to any celestial body, which has a daily vicissitude of day and night, and sometimes longer days, sometimes longer nights. In God is nothing of this kind. He is mere light. If there Is any such vicissitude, it is in ourselves, not in him. Jas 1:17 Every good gift and every perfect gift is from above. All gifts that truly bless us are God's gifts. And cometh down from the Father of lights. God, the Creator of every light of the material world, and the source of all moral light. With whom is no variableness, neither shadow of turning. God is unchangeable, always the same, nor does he cast a "shadow of turning" like the sun. The allusion is to the constantly changing shadows of objects in the sunlight caused by the movement, not of the sun, but of the earth. If it is good and if it is perfect then it came from God. I must take to heart that He said that the gift is both good and perfect. If one lacks another then it is not from God . It has to be in the light for God is light. Also there is no turning or variableness with Him. He does not change from one thing to another. God is so GOOOOOG !!!! this verse says it all about our Lord,even those who have no belief system, come under his mighty loving power,the rain falls the sun rises on all,King David said all other gods are the work of mens hands,there is no other to call upon, only Jesus, who payed it all on the cross for our sins,that is the greatest gift of all.